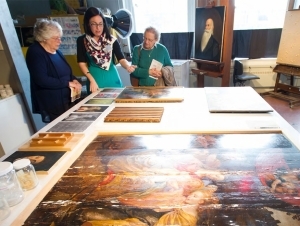 A recent Buffalo Rising article focused on the Art Conservation Department’s upcoming Open House, Saturday, October 17, from 11:00 a.m. to 2:00 p.m. in Rockwell Hall. Patrick Ravines, associate professor and director of art conservation, discussed what the public can expect to see and how renovations to Rockwell Hall have benefited this prestigious graduate program. “Visitors are able to see and engage the students and faculty about what is going on, how the conservation treatments are decided and executed, and all the science and technology involved in the preservation of these valuable items," said Ravines.